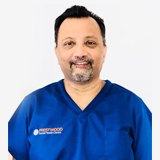 Dr Amit took over the Prestwood Dental Health Centre in April 2008, the core principles that Amit works by are prevention and a well motivated patient. 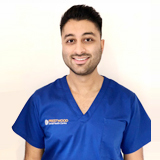 In dentistry prevention and hygiene are paramount, Amit has a keen interest in periodontal treatment and works closely with his hygienist to ensure patients have a good foundation for any other treatment to succeed. Secondly it is very important to have a well motivated patient, who enjoys (yes enjoys!) coming to the dentist. In order to help patients with their motivation, Amit focuses on the patient as a whole and will discuss diet, nutrition, exercise as well as the aesthetic components of dentistry. Amit is always happy to spend time with nervous or phobic patients. Often patients just need time to become familiar with the surroundings, the equipment and with the team themselves. Amit is a strong believer in keeping up to date with the latest developments in the dental profession. He is committed to continuously learning and developing his skills. He has a particular interest in facial rejuvenation and offers wrinkle relaxing treatments and fillers to combat the signs of tired and ageing skin. When he is not fixing teeth or relaxing wrinkles Amit tries to find the time to keep fit, whether it’s the three peaks challenge, the wolf run or just going to the gym he’s never one to shy away from a challenge! Dr Sonny Handa has been at the Practice for 25 years. 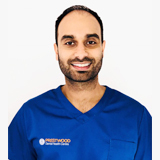 He brings a magnitude of experience after joining the team here as full time and is highly skilled in all areas of general practice with a strong interest in aesthetic and cosmetic dentistry, oral surgery and orthodontics. He also has a passion for children’s dental health with a strong emphasis on prevention and regular screening. He is registered provider with Fastbraces, Byte c-thru, Somnowell and Enlighten Teeth Whitening. He has a passion for travel and scuba diving, koi keeping, and follows football religiously. Lives and Loves his life through Dentistry, and in helping people to smile and gain their confidence. Dr. Bakrania qualified from The University of Manchester in 2010 and has since been working in general practice between Hertfordshire and Oxfordshire. 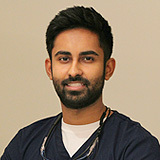 Raj enjoys restorative dentistry as a whole, with particular emphasis on utilising composite resins to achieve optimal results, both aesthetically and conservatively. He also enjoys using this in combination with the Six Months Smiles and Invisalign systems to provide his patients with the smile they are after. With his relaxing and calm demeanour, he prides himself in treating particularly anxious and phobic patients, and is proud to have many patient recommendations based on this alone. When not practicing dentistry, Raj has a keen passion for music and home restoration & renovation, and also enjoys helping his wife with her budding fashion business. Dilan graduated from Barts & The Royal London Dental Institute and subsequently passed examinations to be awarded his Membership of the Faculty of Dental Surgery of the Royal College of Surgeons of Edinburgh. Following a year in general dental practice, he then went on to hold a position as a Senior House Officer in Restorative Dentistry, at the Royal London Dental Institute, the position enabled him to further enhance his skill under the guidance of top consultants within their fields and he was awarded the Best Clinical Case Presentation Prize in 2013. Coinciding with this, he began his Diploma in Primary Dental Care at the University of Kent, which he completed with distinction in 2014. During his undergraduate degree, he was fortunate enough to complete a 3 month exchange in Sweden with the Karolinska Dental Institute; which may have seeded the idea which led to him working abroad within private practice in Singapore from 2014-2018. Throughout this period he continued to expand his dental skill set, taking various courses in implants and orthodontics. He has a sociable character and relishes the opportunity to help improve the oral health of every single one of his patients through good discussions of any dental issues they may have, and the delivery of high quality dental treatment. In his spare time Dilan enjoys playing golf, keeping fit and playing the guitar, he also loves to travel and is always planning his next activity holiday. Rosie qualified as a dental hygienist in Edinburgh, worked for two and a half years in the Channel Islands before returning to her native Northern Ireland where she worked for seven and a half years. During that time she was the secretary of the Northern Ireland branch of the British Dental Hygienists and Therapists Association. 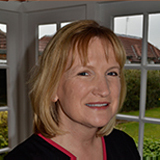 Rosie then moved to Buckinghamshire where she worked as a hygienist for six years before moving south to join the Brocklehurst Dental Practice. She is trained to give local anaesthetics, which enable her to carry out thorough hygiene procedures in a completely painless way. Rosie is married with two young girls. 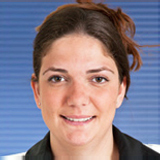 Hayley first began her dentistry career after leaving school as a dental receptionist. As she developed a keen interest in dentistry she progressed through the ranks and has now gained a dual qualification in both dental hygiene and dental therapy. She graduated in 2007 from Queen Mary University of London. Hayley is passionate about educating patients on their oral health and working with them to achieve a level of understanding and a good oral hygiene regime. This enables patients to maintain their oral health for themselves in between appointments. Hayley also enjoys working with patients who have had extensive cosmetic treatment, as they would have invested a lot of time and emotion into their smiles and therefore need to be able to work with her to keep everything as healthy as possible to maintain its longevity.